In my previous blog, I talked about the concept of Mindful Eating and how often we instead of being mindful become mindless. 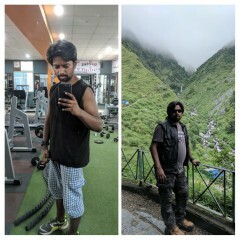 (https://goqii.com/blog/mindful-eating-the-best-habit-ever/).Mindless eating is when we overeat, eat fast, do some emotional eating while we are not really hungry and disconnect with food. The first blog summarised the fact that it is extremely important to make the ‘connect’ with your food choices. Attempt to learn or acknowledge the ingredients of the dish you are eating, which food group it belongs to, combining it in ways you can enhance (or deplete) it’s nutritional quotient, and most importantly how you truly feel having it. Today, I am going to talk about the art of eating slow. Eating is a biologically natural and pleasurable act of nourishment. More often than not, most of us may not even recall everything that we ate in last few hours, let alone-the sensation associated with it. 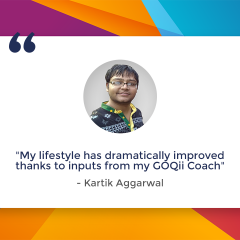 That is largely because we indulge in other things most times along with eating – working, driving, reading, watching television, surfing the net, social networking or simultaneously feeding a child, a pet or an emotion. This act of mindless eating –lack of awareness of the food we are consuming- may becontributing to the national obesity epidemic and the lifestyle diseases and disorders prevalent around. Mindful eating is nothing but, an act of eating our food with attention. Sensing the flavours, recognizing the ingredients and enjoying the dish and thus feeling gratitude towards the meal. Following mindful eating pattern you will not only reverse your weight issues, but also fix them up for life. Eating fast is a habit in disorder. If you eat fast, you are just one step away from digestive troubles, weight gain and other metabolic dysfunctions. Here is what happens when you eat fast? One is you skip the first step of digestion of the food, which happens when enzymes in the saliva break down the morsels when you are chewing them. This Bolus which is softened food morsel is much easier to get digested by the acids of the stomach. Second -since you are rushing through– large chunks of undigested food is filling up your stomach- too much and too quickly. The stretch receptors of your stomach are slow acting fibres (can’t help -that is how they are made!) so when they can’t match up with the speed, the spill over happens,leading to acid reflux, burn in the chest, food regurgitation, and acid after taste in mouth. What is supposed to be an act of pleasure turns out to be a painful experience! Third-The delicate hormonal cross talk which happens between hunger, satiety and fullness hormones doesn’t happen that smoothlywhen you are gobbling down your meal, leaving one having more food but yet not satisfied. 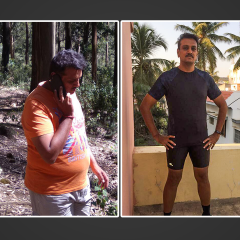 That is why adopting slow eating as a good habit for life is necessary, to eliminate the digestive disorders, fix up weight struggles and feel satisfied with our meals, with our life. In this article, I’ll share ways to build up your innate capability to eat slowly.As you’ll go down the pointers, pick up only one or two that you can follow easily and when you return back to this article, gradually learn more ways to practice slow eating as way of life. 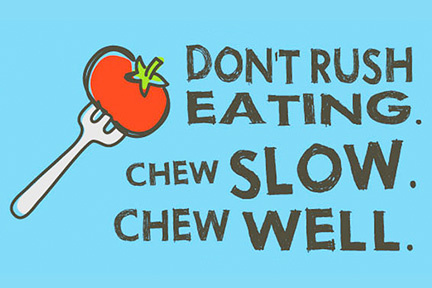 Chew well: Digestion of your food begins from the mouth. Gulping down your food will prevent your stomach to match up with your tongue. And, do you also know that you can’t taste your food until its mixed with saliva. Hence chewing your food thoroughly not only improves digestion but enhances perceptibility of the falvor of your food as well. To practice chewing well and long, take smaller bites and designate number of chew per bite. Anything more than your current number till you reachover20 is perfect. 20 seconds to every chew is also a wise idea. Engage all your sense while eating: Sniffing the food morsel before putting it in your mouth and appreciating its taste brings in more satisfaction from the food. Also notice colours in your food and feel its texture in your mouth. Chew well then and you’ll find yourself turning into a slow eeater automatically. Deep breathe after every few bites: By following this tip, you’ll buy some more time for your tummy to assimilate all the previous morsels. The excess O2 taken in by extra breathing will also aid in better oxidation of the fats in the food. Add fibers to your meal-They take a long time to chew. Crunching salads after every few bites will additionally supply raw enzymes to digest cooked portions of your meals. Take intermission break- Putdown your spoon and fork once your done with half your meal. This break can last till you have finished a mini conversation or taken 24-30 breaths. # Or push away from table, get up for the second helping, take some sips of water in between, to take a break. Pace with a slow eater-Rather than a ferocious one. We unconsciously imitate people we are close to. 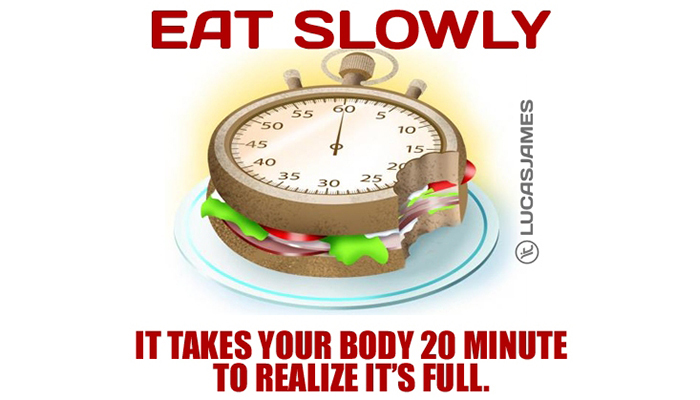 So eating with a slow eater will also slow you down. Use non dominant hand to eat or use chopsticks for a week-If you make the task difficult it automatically forces you to pace down. Eat with a baby spoon/fork: By law of volume metrics, eating with a baby spoon will put a speed breaker on your food ride. Work up your food:Shell your pistachios or peanuts or seeds and peel your oranges yourself. Shelling, peeling or individual unwrapping of your snack will also help slow you down and reduce the tendency to over consume any snack. Refuel-every 3-4 hours: Keeping long gaps between meals will prevent you from following slow eating, as mind is weak in the knees when we are famished. Hence, eat frequently to prevent over eating and practice slow eating at any meal time. Practicing slow eating takes time. If you are a super fast eater, and you are trying these methods to change your habit for good, don’t punish yourself if you don’t succeed in the first few weeks. Try and try till you succeed. And, if you still fail, take help of your coach, to make you practice and push towards rewiring your old habit into a new one of slow mindful eating. In my next blog in this five part series, I will be talking about Portion Control. I shall share some good tricks and hacks which will help you prevent over eating and the need to diet ever. Am glad you find the tips useful. Start working on the same and improve your eating time till you reach close to 20 mins. You will definitely feel the difference in your portion size/digestion and overall weight maintenance. 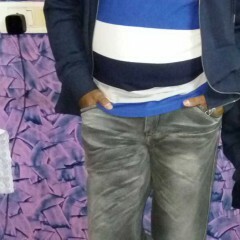 Geetika, very help ful for my acid reflux problem.